I just finished four wonderful days of birding in the Smokies, helping out with the 66th Annual Spring Wildflower Pilgrimage. Well 3.8 wonderful days and .2 days getting drenched last Friday before we gave up, man those pilgrims are tough! Thanks to the efforts of avid birder and owner of Ventures Birding Tours (Asheville) Simon Thompson, this is the second year of expanded birding programs during the annual Wildflower Pilgrimage. No doubt about it – wildflowers are still the star of this annual event and always will be but the event has always been inclusive providing bat walks, bear walks, hog walks, photography workshops, etc. and birds have always been a part of it and as far as I can tell adding more birding has gone over well with pilgrims. I flew solo Wednesday, birding at the Oconaluftee Visitor Center and Collins Creek picnic area. Thursday and Friday I got to team up (for the second year) with perennial trip leader Fred Holtzclaw and Saturday I joined Morton Massey of Knoxville. Conditions were much better at Oconaluftee this year than last – we started in the 50-degree range instead of the 30s. Oconaluftee provided, as we hoped, a chance for “open area” birds. We had song sparrows, chipping sparrows, savannah sparrows, red-winged blackbirds, tree swallows, wild turkeys, eastern bluebirds and palm warblers to name a few. Then we headed to the woods at Collins Creek picnic area and found blackburnian warbler, black and white warbler, ovenbird, American redstart and more. Thursday morning I joined Fred for a caravan to Cades Cove. The birding was a bit slower than the previous morning, although black-throated green warblers and indigo buntings at the first stop made things bearable bird-wise and with Fred there to educate us about the amazing flora surrounding us we sometimes forgot to look up. Did you know that our sweet shrub, Calycanthus floridus, is one of the oldest genera of flowering plants in the world dating back 144 million years or so? If you had been on our Pilgrimage trip you would have. And while the day may have seemed a little slow on the birding side, we wound up with great looks at eastern meadowlark and common yellowthroat in Cades Cove. Friday morning, with a front fast approaching, started out like gangbusters. We got decent looks at scarlet tanagers and had American goldfinches, indigo buntings and white-throated sparrows all in the same view, on the ground, tearing at dandelion seeds. The rains came and washed us away but we had a great list of 41 species going. Saturday was a strange morning. Despite promises of clearing skies we were stuck in a cool and thick muck of clouds and haze. 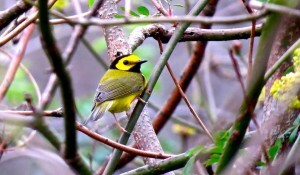 Still there were high points like great looks at the often secretive Kentucky warbler and the chance to watch Louisiana waterthrushes building a nest at the Sugarlands Visitor Center. Although the trip was billed as “Wood Warblers,” we thought we might escape the clouds and mist by heading up to Newfound Gap, hoping to get above the fray. Well Newfound was socked in, windy and quite cool. But we were there and might as well get out and look around, right? That’s when one of those strange “birding moments” occurred; we were in the parking lot at Newfound when someone pointed up and said, “What’s that?” Well, there in the mist and wind at more than 5,000 feet in elevation was a common merganser. And just behind was a group of double-crested cormorants, followed by a few more mergansers and then a group of common loons. A broad-winged hawk and an osprey soon joined the migrants trying to get across the gap. This serendipitous birding is one of the things that draws me to my hobby. The front had undoubtedly shaken up migration. We also found other migrants like wood thrush and palm warbler at Newfound plus more common high-elevation species like northern saw-whet owl, black-capped chickadees, red-breasted nuthatches and golden-crowned kinglets. I guess the thing to remember about normal migration is – it’s never normal.